For over 50 years, All-Outdoors has benefited by having the opportunity to share some of the most beautiful river canyons in California with our guests. And for over 50 years, All-Outdoors has been committed to protecting California's most precious commodity... it's rivers. While decisions regarding the preservation of wilderness are complex and difficult, we feel that rivers deserve to be treated delicately, and with the utmost respect. The role which rivers play in cleansing and transporting surface water is often overlooked and underestimated. A healthy river system provides clean drinking water, stable fisheries, recreational opportunities, and irrigation water. The water you drink at home may be the same water which carried you downstream on your last rafting trip. Friends of the River (F.O.R. 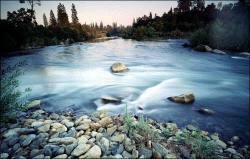 ), the leading river preservation group in California, was formed in the 1970’s. Its first goal was to stop the construction of the dam that filled the New Melones Reservoir, resulting in the flooding of the Camp Nine Class III section of the Stanislaus River. F.O.R. lost that battle when the reservoir was filled in 1982. Lessons learned in the Stanislaus campaign helped F.O.R. secure national Wild and Scenic River status for the Tuolumne River in the mid-1980’s. Presently F.O.R.’s main focus is its opposition to the proposed construction of the Auburn Dam. Over a 25 year period, F.O.R. has matured into one of the state’s leaders in river preservation, conservation and education. It was during the Stanislaus campaign that All-Outdoors developed a partnership with F.O.R., which has grown over the years. During the Tuolumne campaign All-Outdoors was one of the outfitters instrumental in developing campaign strategy. In the 1980’s George Armstrong served on the F.O.R. board of directors. Presently, Scott Armstrong is in his fourth year on the board. F.O.R. has become a great resource for river education. Available through this organization is a variety of written publications and videos. Its representatives are often invited as guest speakers on guide interpretive trips. They are helpful in educating guides regarding water management, the political battles facing our California rivers and the environmental impact of waterway manipulation. Leave No Trace is a national educational program that promotes and inspires responsible outdoor recreation through education, research and partnership. Leave No Trace (LNT) unites the U.S. Forest Service, National Park Service, Bureau of Land Management, U.S. Fish and Wildlife Service, educational programs and the outdoor industry in teaching the public to enjoy the outdoors without harming it. All Outdoors is a partner member of Leave No Trace and supports their mission as a Partner Member. As a supporter we've pledged to practice, teach and implement minimum impact education in our whitewater rafting program and every commercial rafting trip we run. All-Outdoors holds to the belief that a river is a vehicle in which to experience the river canyon. The natural landscape and river’s cultural treasures are the river’s showcase, displaying all that it can offer the interested student. To help meet our conservation objectives, All-Outdoors offers interpretive trips to our guests and guides to provide a deeper understanding of the many intrinsic values of our rivers, as well as the intimate relationship we have with the canyons. - During the 1980’s All-Outdoors’ relationship with river-governing agencies changed from that of a regulatory partnership to one in which joint interest in educating the public about “their” river canyons became the common goal. - In 1991, working as partners with BLM, All-Outdoors helped develop a pilot workshop on the Merced River that was offered to agency employees and guides of Merced outfitters. During this two-day river trip participants worked on interactive interpretation, safety procedures, and effective communication between agencies and outfitters. It was one of the first of its kind in the nation. The workshop brought guides, owners and government officials together to share and learn how to provide the public with a better program in instructing them on the use of their natural resources. - In 1993, All-Outdoors worked with Friends of the River (F.O.R.) to create a workshop on the Main Stanislaus for all guides in the area. - In 1994 All-Outdoors joined with the Auburn State Recreation Area in developing and implementing a four-day river interpretive program on the North and Middle Forks of the American River. The River Interpretive Program (RIP) was an attempt to train guides on the natural and cultural history of the American River Canyons. The program was made available to all of the twenty-five commercial outfitters on the North and Middle Forks. - In 1996 the (RIP) program expanded to incorporate local teachers. Teachers were offered continuing education units for attending the program. By addressing guides and teachers, the program has life beyond the river canyons and an ability to reach thousands of individuals. State parks organized the extensive list of speakers including naturalists, biologists, historians and water management personnel. All-Outdoors organized the logistical end of the workshop. The curriculum was a cooperative effort aimed at providing river guides and teachers with interpretive skills and knowledge in order to provide guests and students with a more holistic understanding of the watershed. The workshop is now nationally recognized as a model on-river outdoor education training program. - Over the last 10 years, we have provided educational interpretive trips for numerous schools and community groups, allowing students to gain appreciation for our California rivers. - In 2006 we developed an experiential education program called the Floating Classroom. There are 1200 dams on California's 800 rivers. Nationwide, less than 1/3 of one percent of the total river miles are protected within the National Wild and Scenic River System with the vast majority of these miles residing in Alaska. Today, there are several rivers on which All-Outdoors conducts trips that are threatened by hydro projects. A 10 year legislation moratorium preventing the study and/or building of dam projects ended in 1992. In years past there has been talk of a potential hydro project in the Coloma valley that would flood a good portion of the upper canyon. The proposed 500' Auburn Dam would flood the entire Middle Fork Canyon, and 20 miles of the North Fork Canyon. In 2005, Congressman John Doolittle ressurected the fight for the Auburn Dam once again, even though there are better, cheaper and more efficient alternatives to building the dam. A proposed Dam Project on the Clavey River would destroy a beautiful and pristine tributary to the Tuolomne. This same project could adversly effect the Tuolumne River as well. Thirteen miles of the Merced River canyon (from Briceburg to Bagby) are threatened by a proposed dam. This same stretch river is currently under study for inclusion into the National Wild & Scenic River System. Every time you choose to raft with All-Outdoors, you are choosing to make a direct contribution to the preservation of wilderness. We donate a portion of your trip fees to non-profit organizations such as Friends of the River, one of the most influential river preservation organizations in the world. Our guides donate their time for river clean-up trips on many of the rivers we run. "Wilderness compliments and completes civilization. Any society that feels itself too poor to afford the preservation of wilderness is not worthy of the name of civilization."